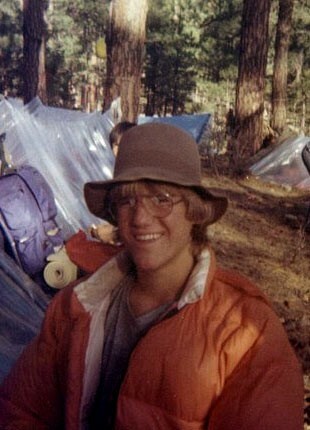 Fred Gillmore (Gil) Harrold, 16, of 4317 Durango, died in Van Horn Sunday, April 10, 1977 during a backpacking trip with 23 other students and five adult sponsors after a sudden illness. The other 23 studends and five adult sponsors on the trip left the Gila Wilderness shortly after noon New Mexico time Monday for the return trip to Odessa. The 28 persons are to arrive back in Odessa about 11:30 p.m. Monday, according to Supt. Bill Holm who has been in contact with the trip sponsors Ron Pressly and Henry Sickels. The group was to stop in El Paso and phone Holm to see what measures if any should be taken. Holm has alerted the Texas Department of Public Safety to provide any assistance necessary on the return trip. Families of the students have been notified to contact their personal physicians as soon as possible. The Harrold youth apparently became ill on the school bus Saturday morning after the group spent the night in El Paso. He was treated at a clinic on Silver City, N.M., where the illness was first diagnosed as flu. He was taken to Deming, N.M., to catch a commercial bus home after his parents had been notified. He became ill on the bus and the driver stopped in Van Horn, where the youth was taken to a hospital. He died at the hospital early Sunday morning. An autopsy listed the cause of death tentatively as a form of meningitis that is contracted only through direct contact. According to Holm, none of the other students nor advisors have complained of illness. Services for the Permian High School sophomore are set at 10 a.m. Tuesday in the Hubbard-Kelly Funeral Home chapel, with burial following that afternoon at 4 p.m. in a graveside service at Breckenridge Cemetery. Harrold was born Sept. 17, 1960, in Breckenridge. He moved to Odessa in 1963 from Breckenridge and was a member of Bethany Christian Church. He played junior varsity football at PHS, Little League baseball and was a Boy Scout. Survivors include his parents, Mr. and Mrs. Roger Phillip Harrold Sr. of the home address; a brother Roger Phillp Harrold Jr. and a sister Julie Harrold, both of the home; his grandmother, Julia Harrold of Mineral Wells; and his grandfather, Roger Harrold of Tucson, AZ. Every Easter I say a prayer for Gil and think of all the the wacky times times we had with Byran Vaughan. Bryan and Gill were some of my mom's favorites at Hood. Gil's Mom Dolly will be giving us some photos to post soon so we can all remember him. Gil and I were friends for our 6 years at Ross. When Gregg Young accidentally broke my ankle in 6th grade, Gil carried me to the office. He made jokes the whole way helping me deal with the pain. I still think of Gil often and smile. Saw Gil on the morning they left--we had hung out for awhile during the week-- Gil and I were becoming close-- His mom and my mom worked at OC together--Still have a picture that Dolly gave me that reminded her of Gil hanging in my classroom--I still miss him-- He was a good dude! I remember my mom taking alot of us to the funeral, me, Barry Rogers, Ricky White, Mark Enriquez, Michael Moore. Yes, me without any other girls. Those guys were my buddies for life. Wish I could see all of them again. Gil, you got swats from the shop teacher for patting my behind. I was frankly flattered. You were hot! He was great. I was on that backpacking trip with Gil. As always, he was a fun guy having a great time. What a shock it was to have a Ranger on horseback ride up and tell us that he had died. It seemed that we had just seen him get off the bus. As a sophmore, it was all too strange. Kind of a dreamy, this isn't really happening kinda stuff. It's still unbelievable today, some 30+ years later. Now, as the father of a high school boy, I hurt for his family. They sent him on a campout, but he never came home. That'd be tough. We remember you Gil. I think of Gil every year of his passing and have always missed his smiles. He was always so sweet to me. I remember a lot of old memories from all the way back as 1st grade with him, Bryan Vaughn (my neighbor-just 2 doors down,) Lisa Vaught, Lisa Edwards, Brant Donaldson- since Kindergarten, Bridgett Daniels, Ricky Boen, Paul Henry, Ann Moore, Donica Nichols, Robbins girls, Lisa Albritton, etc., and all of us from Ross Elementary through H.S., even his (also blonde haired cousins) the Williams family (which my family were so close and I always enjoy stopping by when I'm in Odessa), we all had parties together at Hood Jr. High. I remember we always raced to the snowcone man at the corner of Ross Elementary after school and the summers of fun at Sherwood Swimming Pool when Gil would chase us girls at one time or another! Bryan and Gil were inseparable back then. Our older siblings went to school together. Band together at Hood. It was heart wrenching to see you go so soon and unfairly, you've always been missed my sweet friend from all us from the old neighborhood - the very beginning of our school years! We talked every nite on the phone. My mother would make us hang up every nite, way past midnight or bedtime each nite. I loved you as a friend. We were never more, but you were the single greatest guy friend I had in 9th grade. You spent the last week before your trip on Easter in D-Hall... I could never sit at lunch with you that week. So, I wrote you a really long three page letter.. I walked it to D-Hall and asked the teacher to give it to you... It was to say good-bye for the Spring/Easter Break and to probably tell you all the crazy stuff that had happened that week in our lives. I watched the teacher place that letter in her desk, telling me that she would give it to you later. I was at the bus, the time you left on your trip. We waved good-bye..You hung out the window yelling at me....And to this day.. I have no idea if your D-hall teacher ever gave you that letter?? I have been haunted by the fact that she may have never given my letter to you... But know that I miss you and have missed you since that day. I was in San Francisco on our Spring Break when I found out you had died. I was shocked and so sad. My father made me take the medication, since we had been friends, so I wouldn't get miningitus too. But, we were only friends.. I knew I was fine...I have missed you since that Easter. I have always loved you and thought of you since that terrible week. You were my first really close friend to passaway.. My heart feels it so deeply to this day..
that won't be OUR last backpacking trip will it brother gil? I remember that backpacking trip and how disappointed and surprised we all were that Gil did not feel well enough to go forward with the trip. We had all been in the back of the bus having a good time and excited about the Gila wilderness. We were all stunned into shock when the park ranger met us on the trail to tell us that Gil had died on the way home. We built a rock cairn in memory of Gil and our feelings of loss in his passing. We immediately hiked out and got back on the bus for a very long trip back to Odessa. We went into the auditorium at the school and were told the story of Gil's trip and his ulitmate trip home. I still have fond memories of the backpacking trips we took as part of the school programs. Had some very good times on those trips. We saw some spectacular places together. I will miss you Gil.